Andrew Sarris of The New York Observer said "There is more greed-driven corruption in the remake than there was in the original" and that the film is less a remake "than a resurrection of both the film and its now unfashionable genre." Sarris said Fonda and Foster "are especially memorable" and said "the performances of Mr. Crowe and Mr. Bale alone are worth the price of admission. "The New Yorker film critic David Denby wrote that the film "is faster, more cynical, and more brutal" than the 1957 film. Denby wrote that Fonda "gives an amazingly fierce performance" and that Crowe "gives a fascinating, self-amused performance", saying "Crowe is an acting genius." Denby said "this is by far [director James Mangold's] most sustained and evocative work." 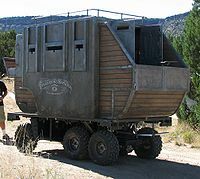 Denby wrote that "much of this Western is tense and intricately wrought. "Ty Burr of The Boston Globe called the film "lean, almost absurdly satisfying." Burr wrote that Crowe and Bale "are among the best, most intuitively creative we have, and whatever transpires offscreen in Crowe’s case, onscreen they only serve their characters. Neither man showboats here, and it’s a thrill to watch them work." Burr said that the character of Ben Wade is "a snake and a snake charmer in one irresistible package" and said Foster as Charlie Prince is "mesmerizing." Burr said "Bale and Crowe never once misstep" and that Mangold "steers clear of Deadwood revisionism." Burr, however, wrote that the ending "makes little to no sense in a post-Clint Eastwood universe." Christian Science Monitor critic Peter Rainer gave the film a "B+" and wrote "what Alfred Hitchcock once said about thrillers also applies to Westerns: The stronger the bad guy, the better the film. 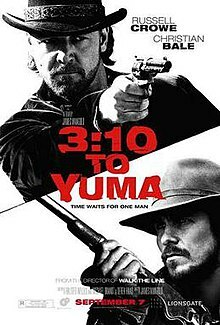 By that measure, 3:10 to Yuma is excellent." Comparing the film to the 1957 film, Rainer wrote that the film "is larger in scope than its predecessor, and significantly altered in its ending, but essentially it's the same old morality play." Rainer said the "drippy father-son stuff is the least successful aspect of the movie." Rainer also wrote "Bale acts as if he's still playing the POW survivalist from Werner Herzog's Rescue Dawn" and said "his hyperrealistic performance is a drag next to Crowe's dapper prince of darkness." Rainer said Crowe's "underplaying here is in many ways as hammy as if he were overplaying, and that's just fine. "Richard Schickel of TIME magazine said "when a movie is as entertaining as this one, you begin to think this formerly beloved genre is due for a revival." Schickel said the 1957 film "was, in my opinion, not as good as a lot of people thought" and said Crowe "never settles for predictability when he's on screen and never lets us settle into complacency as we watch him." Schickel wrote that director Mangold "never loses his crispness or his narrative efficiency." Schickel said the comparisons to Unforgiven "are not entirely apt", saying that "Mangold's offering lacks the blackness and absurdity" of that film. He wrote, "It is more in the vein of Anthony Mann's westerns of the 1950s — trim, efficiently paced, full of briskly stated conflicts that edge up to the dark side, but never fully embrace it." ^ "UGO.com Best Second-In-Commands". UGO.com. March 17, 2012. Archived from the original on October 14, 2012. Retrieved March 17, 2012.